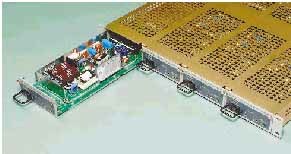 The 1U high rack adapter will mount four of the low profile 50W, 100W and 150W (Series HSF-1UR or HSF-1U) power supplies. Each plug-in power supply is equipped with a power on/off, indicator LEDs and voltage test points. The RA 19-1U provides access to the DIP switches and rack keying without disassembling the rack. 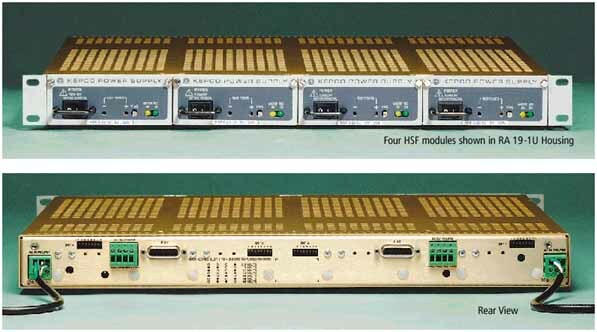 It also provides a redundant scheme with modules 1 and 3 being powered from one a-c input and modules 2 and 4 from a second a-c input. Module numbering is left to right facing the front panel.